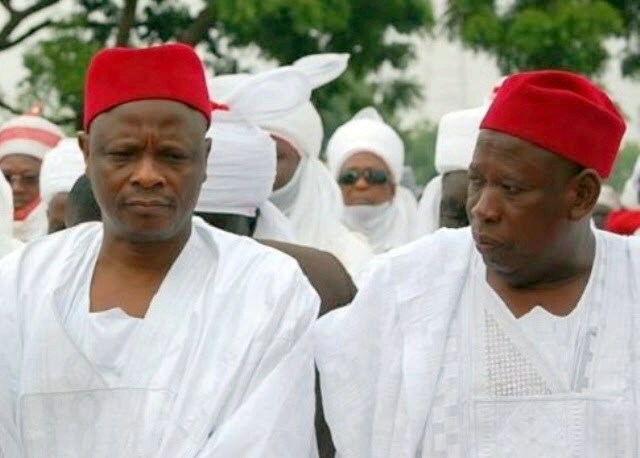 Governor Abdullahi Umar Ganduje of Kano state has disclosed how his misunderstanding with the immediate past governor of his state, Senator Rabiu Kwankwaso started. The governor recalled that they were very close and things went sour before 1999. Speaking to Daily Sun, He said: "Yes, we were very, very close. Even before 1999, we have been friends. I was Commissioner for Works and Transport for six years during the military, and my former governor is a politician right from the military when political parties were formed.“I started politics right from 1978, and in 1979 during the NPN period, I even contested election and was even part of the executive members of the party in the state. So, politics is not something I am just starting now. "So, we contested together for governorship in 1999 and the result was controversial. Prince Tony Momoh was in Kano to supervise the primaries, the result was controversial; the elders reconciled us that he should be governor and I should be the deputy governor. I insisted that there should be re-election, but elders pleaded and I agreed to be the deputy governor. Tony Momoh is still alive, you can ask him.“And since I became the deputy governor I had to do it well. I had to be loyal, respectful and honest. So, I worked hard to add value to the government by supporting the governor not only by being loyal to him but working very hard to fill the gaps, promote the government and work round the clock to ensure when he is not around there is no difference. That is how we worked together. Even when he was a minister, I was with him. I was on my own when he invited me to come and be his adviser when he was Minister of Defence. I agreed because after all, we have been together, and he felt we could work together.“When we won the elections in 2011, he graciously invited me, it was not as a result of any contest between us, but out of his own volition. I have to thank him for that because he could have invited someone else.“So, we worked together peacefully. When I was nominated and after I won the elections in 2015, before handing over, I started seeing some elements of undercuts from his body language. "He didn’t attend my swearing-in, he just handed over and left for Abuja because he claimed he had something to do. I said okay and went for the swearing-in.“A night before he left, I went to him and I said during my campaign, I said that my administration will be a government of continuity. I told him that I want to retain the Secretary to the State Government. The SSG did not know, I was the one that told him. I told him that I want to retain the Accountant General.“The DG Media is his friend, I told him I want to retain him, and I later made him a Permanent Secretary. The Press Secretary, I told him I want to retain him, so he phoned and told him. And then the four administrative staff in the office, I asked him ‘will you like to take some’, he said he was taking only one, the remaining three are still in my office. So, that was a symbol of continuity. "Then it came to the appointment of commissioners and, of course, from his body language I had started seeing some elements of disagreements. So, I didn’t get his opinion on the appointment of the commissioners because I thought that was not even necessary because the commissioners are not as strong in government as SSG and the Accountant General.“So, I thought it was something I could do. Even at that, my Commissioner for Agriculture now was also his Commissioner for Agriculture, we are still together; the Commissioner for Local Government is a younger brother to his wife, he was chairman of local government during his time; the Commissioner for Water Resources was an adviser in his government; the Commissioner for Finance was also Commissioner for Finance in his government.